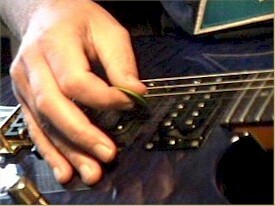 Lyle: Notice my finger placement, it's right behind the 3rd fret wire. Lyle: There are many ways to play a G chord, and I hope you'll learn all of them later, but this is the first chord I remember learning. Lyle: There are many types of chords and they can have strange sounding names to them. You'll learn the music theory behind everything at a later time. I think you should just learn to play now, memorize the names of what you're playing, then learn the theory part at a later time. 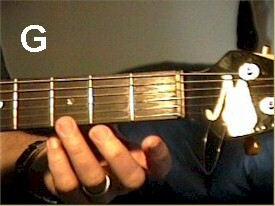 Lyle: Notice your 1st finger is used on the 1st fret, and it's tucked right behind the first fret. Lyle: Now you've learned 3 basic one finger chords. They all use just 3 strings. Make sure you're using the correct fingers for each chord. This way you'll look just like a pro playing! 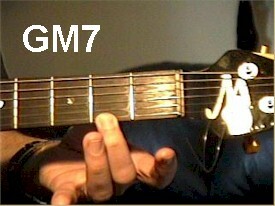 Lyle: The G chord uses the 3rd/ring finger, the GM7 uses the 2nd/middle finger, and the G7 uses the 1st/index finger. This is very important. francric: What is the significance of M7 and 7? Lyle: Those are the names of different sounding chords. Chords will have many different names to them. I'll cover music theory in later lessons. Lyle: Now you'll take those three chords and learn to play them with a band! Look at this chord chart, it will display the chord progression you will learn next. Lyle: Notice there are 4 groups of 4 beats, and a chord name at the beginning of each group. These groups of beats are divided into measures. 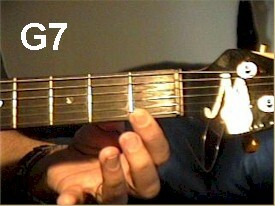 There are 4 measures in the chord chart. Lyle: Be sure to listen to the TAB so you can hear my guitar playing with the band, or watch the video clip. francric: That jam track really makes a difference!!!!! Support: You can also slow down the jam track without changing the pitch, using the "tempo" button. Lyle: Try to copy what I'm doing in the video and you'll be playing exactly what I'm showing you here! Support: That works with both the tab notation and the jam tracks, slowing the tempo down. Lyle: So you see you've been adding strums in each measure, making it sound like you're playing faster, but the tempo of the jam has stayed the same. Lyle: Try to play right along with the jam track to help your timing. Learn to listen to both you and the jam track at the same time. Lyle: That's right Joel, always try to keep counting to 4. Tap your foot to each of the 4 beats while you count! Lyle: Sorry to keep you all late after class, let's take a break. Any quick questions before I have to go? Steve-o: What kind of pick is it that you use? Lyle: I use a green Dunlop Tortex .88 pick. It's almost a heavy gauge pick with a very slight give to it. I suggest using a medium or heavy pick for a beginner. The light gauge picks are too thin and thus produce a thin tone. Lyle: Let me know if you have any questions or you would like extra help with your guitar studies. Email me at Lyle@theguitar.net for more info on how you can get your own custom beginner lessons. I can even teach you your favorite songs and you can download the lesson to your hard drive so you don't have to be online to work on them. Thanks, Lyle.